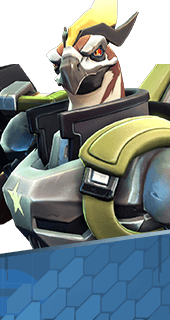 Benedict is a Hero in Battleborn. 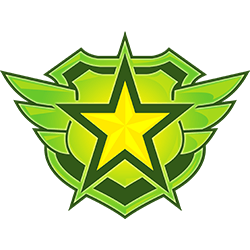 He is unlocked at Command Rank 10 or by winning 5 matches as a United Peacekeeping Republics hero. Fires a rocket that deals 187 damage and targets your enemy for 3 seconds. Subsequent rockets home in on targeted enemies. On activation, Liftoff slows nearby enemies. +1 Second Slow. Increases rocket propulsion speed. +25% Rocket Speed. Increases Benedict’s in-air gliding speed. +25% Flight Speed. On activation, Liftoff damages nearby enemies. +133 Damage. Increases Rocket Launcher’s area of effect. +45% Blast Radius. Increases Rocket Launcher damage while reducing its area of effect. +18% Damage. Reduces Liftoff cooldown, allowing more frequent use. -25% Cooldown Time. Reduces Hawkeye’s cooldown. -25% Cooldown Time. Increases Hawkeye rocket damage. +15% Damage. Increases Boomsday’s explosion radius. +100% Blast Radius.